Teriykai is back on the table, friends! Maybe it never left yours—you probably had a gem of a recipe in your pocket all along. But for me, this quick and simple alternative to the typical sugary, caramel colored junk that’s usually bottled up and enticingly displayed on store shelves is a delightful surprise I’m excited to share. Teriyaki has been off the menu for so long in our house, it was really by a random stroke of luck that I happened across this super fantastic teriyaki sauce recipe, which I modified slightly, from Brewing Happiness. 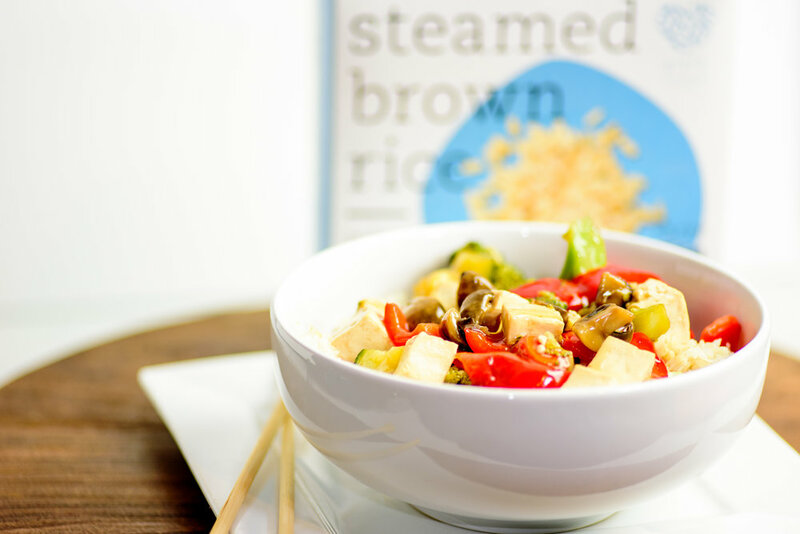 I was snooping around blogland looking for some inspiration to showcase steamed, frozen rice from grain trust that I had the chance to become acquainted with awhile back at a blogger event from Sprouts Farmers Market. At first, I thought I’d try something more ornate, like vegan roast vegetable timbales, or something along those lines. But then I realized, what’s the likelihood that someone seeking out frozen rice is going to want to take the time saved to tinker with stacking layers for timbales? What’s the chance I really want to do that, now or ever in the foreseeable future or limited time? And that was the end of timbale brainstorm. Which turned out to be wonderful, because for some reason, my Google search of the term “rice and vegetable timbale” was interpreted as “rice and vegetable teriyaki”, and fate was sealed. I’ll be honest, I wasn’t expecting much from frozen rice. I never thought about it as an option before. But I quickly understood that grain trust is a special, local company committed to quality and ethical standards. There is direct connection and mutual respect with the growers. Products are all vegan and gluten-free, and from what I’ve tasted so far, they’re perfectly flavorful. Steamed rice is frozen quickly to lock in freshness, and you can tell. The hibachi flavor is incredible. I haven’t been able to get my hands on it since the event, but the plain brown rice (which I used here) is perfection. For the sauce, I swapped in maple syrup for honey, liquid aminos for soy sauce, tapioca flour for corn starch, and upped the fresh ginger and garlic. Chef F is a terrific eater in the first place, but of this dish, he very much highly approves. In fact it’s one of the few that he enjoys as much all in one bowl as deconstructed in neat segments. Of course, the recipe below is just a guide—anything goes when it comes to what you throw in, as always with stir-fry. The sauce is what pulls it all together, and that can be tweaked with ease, too; if you’re not vegan, I would probably say honey has a slight edge. Let me know what gets tossed into your creations, and enjoy! Heat oven to 350° F. Place tofu on a baking sheet lined with silpat. Bake approximately 30 minutes. 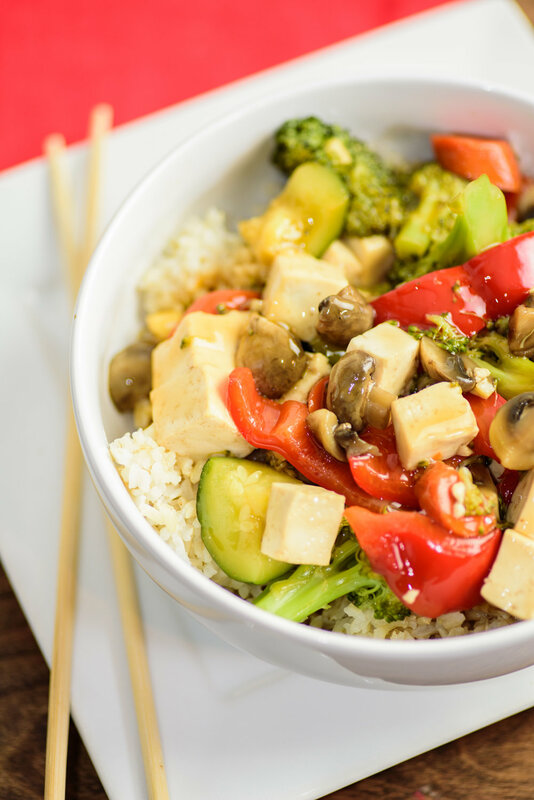 While tofu is baking, prepare the sauce: In a small bowl mix together your cornstarch and water, and set aside. Heat a small pot over medium-high heat. Add in your water, soy sauce, honey, garlic and ginger. Stir. Just as it begins to bubble, add in your cornstarch mixture and stir continuously for 7-10 minutes. Take off the heat and let sit a further 5-10 minutes. While sauce is setting, place vegetables and a little water (about 1/2 cup) in a large skillet over medium-high heat. Cover and let veggies steam approximately 5 minutes. Add teriyaki sauce and tofu. Toss to coat, and let sauce come to a near boil. Remove from heat and serve over brown rice or quinoa. This is a sponsored post on behalf of Sprouts Farmers Market and Grain Trust. All thoughts and opinions are my own. Grain Trust products can be purchased at Sprouts locations throughout Colorado.